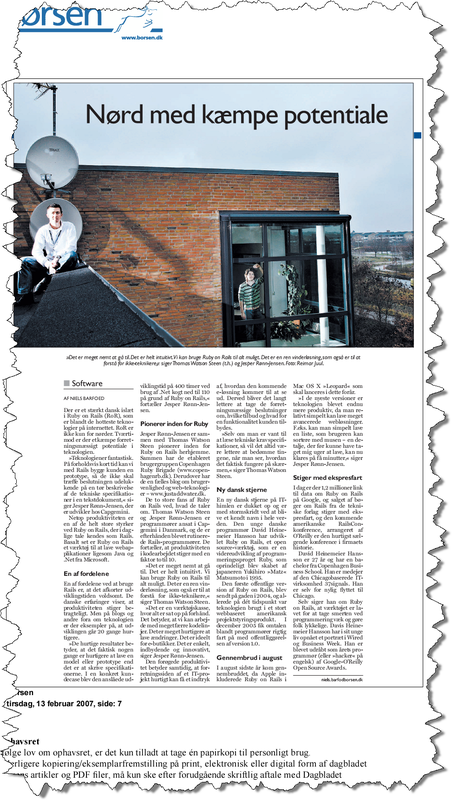 Thomas and I are interviewed in Danish newspaper “Børsen” today. The article is a 10,000 feet business overview on the productivity gains and possibilities with Ruby on Rails. I really like the picture (by Reimar Juul) and the fact that the article mentions both Justaddwater.dk and Copenhagen Ruby Brigade. Woot! For the benefit of the Danish speaking readers, I really want to include the entire text from the article here to make it searchable and quotable for the benefit of everybody who is also interested in Ruby on Rails for enterprise use. Currently I’m awaiting permission from Børsen to include the article here. Also, I’m awaiting a direct link to the Børsen article if you like to read it in it’s original domain. 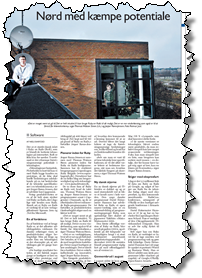 Today’s Newspaper Børsen: avis.borsen.dk, page 47 (requires login/authentication). Link is probably only working today. Capgemini Nordic resources probably have access through corporate intranet via our IP number. This entry was posted by Jesper Rønn-Jensen	on Tuesday, February 13th, 2007 at 09:43 (GMT-1)	and is filed under Businesscase, justaddwater.dk, Ruby on Rails, Web Development. You can follow any responses to this entry through the RSS 2.0 feed. Both comments and pings are currently closed. Because Rails allows to create applications with very little code that is easy to glance, it facilitates agile approach, where one can continuously introduce new features and modifications. Similar flexibility with Java or .NET technologies would be much more expensive. Of course Rails also has some weaknesses, such as still poor tool-support for debugging. Those weaknesses, however, are minor compared to its strengths as simplicity, easiness of use, and good design. I hope that popularity of Rails will bring us more tools and make us even more productive. Vi har udviklet FairRates.dk i Ruby on Rails frameworket, lavet af en dansker David Heinemeier Hannson.